Want your kids to eat more greens? Sauté kale with garlic and pancetta (an Italian bacon)! Have them help you cook and taste it along the way. 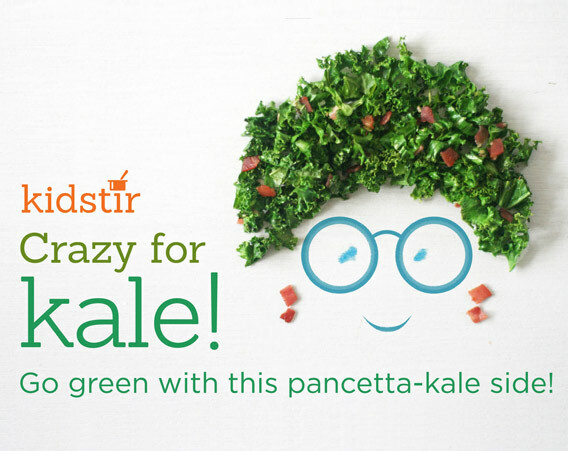 You might find a new kale fan under your roof! 1. Tear the kale into tiny pieces with your hands. Or, you can use kitchen scissors to chop it up finely. Have fun ripping it to shreds, then set it aside. 2. A grown-up can help sauté the Crazy for Kale. First, heat the olive oil in the frying pan for 1 minute. 3. Add the crushed garlic clove to the pan. Cook for 1 minute. 4. Add the diced pancetta and chopped kale. Cook for 5 minutes, stirring occasionally until the kale is wilted and bright green. Add salt to taste. 5. Serve as a dinner side dish. Or, spoon onto crackers or crostini!